Whether you are looking for an awesome gift for your #1 sports fan or you are having a party to celebrate your home team, these Los Angeles Rams Cookies are the way to go!! Each cookie is a handmade 3" round classic butter shortbread cookie, iced with a sugar icing coat. 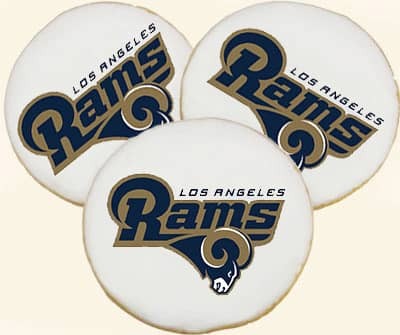 The sharp, vivid images on these delicious Los Angeles Rams Cookies are imprinted using internally built machinery, giving you unsurpassed quality! Your Los Angeles Rams Cookies will arrive in a neatly packaged box that is perfect as a gift or ready for you to enjoy at your party. The Los Angeles Rams Cookies will surely be the hit of your tailgate party! Let us surprise you with our scrumptiously light textured cookie! It's unlike any other photo cookie available.